A summons to set aside a divorce is not an appeal, which asks a higher court to overrule the lower court’s decision and must be filed within 30 days in most states. A summons to set aside a divorce asks the same court to withdraw its decision based on a mistake the court was not aware of when it ruled, usually within one year. The purpose of the answer is to reply to this summons, giving you an opportunity to respond or disagree. The most common reason a person files a summons to set aside a divorce is because he claims he was not given the legally required opportunity to object to the divorce in the first place. If the plaintiff presents evidence of improper service, a summons to set aside the divorce can be filed. Other reasons someone files a summons to set aside a divorce are detailed in state statutes, most of which are modeled after Federal Rules of Civil Procedure Rule 60. One reason would be if there was new evidence the plaintiff could have discovered before the ruling. Another reason could be the judgment was void in the first place. For example, if the husband was already married to someone else at the time of the wedding, the marriage was not legal and is void. In your answer, you must respond to or disagree with these grounds and provide your evidence. An answer to a summons to set aside a divorce is a formal document in which you respond to the other person's claim. For example, if you properly served your ex-spouse, but he claims he wasn't served properly and the divorce should be set aside, dispute this point. Restate that he was properly served and attach your proof. At the end of the answer, include a section in which you specifically ask the court to dismiss the summons. The answer must be filed with the court that originally sent you the summons. Typically the summons tells you the court where you must file as well as the time frame in which you must file. You must reply within the time frame or you lose your right to answer the summons. To file, you can visit the court in person and ask the clerk of court to provide you with the appropriate form to use for your answer. Follow any instructions on the form, attach copies of your evidence, file it there with the clerk of court, and serve a copy on the plaintiff. After you file and serve the answer, ask the clerk of court in your county to notify you of any hearing in the case. What If I Don't Want to Sign Divorce Papers? 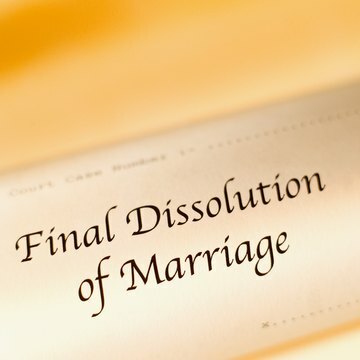 The decision to divorce is not one that should be made in haste, yet once a spouse files for divorce in Oklahoma, he has every interest in moving the case along. If the court feels the plaintiff is dragging his feet, it can enter an order dismissing the case for failure to prosecute with diligence under Oklahoma statute §12-683. Filing a divorce trial brief is different in different states and different counties within each state. This is because different courts have different rules about what must be in the trial brief. The state itself might have specific rules and local courts can expand upon those rules. In general, the trial brief is the documentation you file with the court to notify the court and other party of the relevant information you will bring forth at the divorce trial.